Taste receptor cells are responsible for transducing chemical stimuli into electrical signals that lead to the sense of taste. An important second messenger in taste transduction is IP3, which is involved in both bitter and sweet transduction pathways. Several components of the bitter transduction pathway have been identified, including the T2R/TRB taste receptors, phospholipase C β2, and the G protein subunits α-gustducin, β3, and γ13. However, the identity of the IP3 receptor subtype in this pathway is not known. In the present study we used immunocytochemistry on rodent taste tissue to identify the IP3 receptors expressed in taste cells and to examine taste bud expression patterns for IP3R3. Antibodies against Type I, II, and III IP3 receptors were tested on sections of rat and mouse circumvallate papillae. Robust cytoplasmic labeling for the Type III IP3 receptor (IP3R3) was found in a large subset of taste cells in both species. In contrast, little or no immunoreactivity was seen with antibodies against the Type I or Type II IP3 receptors. To investigate the potential role of IP3R3 in bitter taste transduction, we used double-label immunocytochemistry to determine whether IP3R3 is expressed in the same subset of cells expressing other bitter signaling components. IP3R3 immunoreactive taste cells were also immunoreactive for PLCβ2 and γ13. Alpha-gustducin immunoreactivity was present in a subset of IP3R3, PLCβ2, and γ13 positive cells. IP3R3 is the dominant form of the IP3 receptor expressed in taste cells and our data suggest it plays an important role in bitter taste transduction. Taste receptor cells are specialized epithelial cells, which are organized into discrete endorgans called taste buds. Typical taste buds contain 50-100 polarized taste cells, which extend from the basal lamina to the taste pore, where apical microvilli protrude into the oral cavity. The basolateral membrane forms chemical synapses with primary gustatory neurons (Fig. 1A). In mammals, lingual taste buds are housed in connective tissue structures called papillae. Fungiform papillae are located on the anterior two-thirds of the tongue and typically contain 1-2 taste buds each. Vallate and foliate papillae are found on the posterior tongue and house several hundred taste buds each. 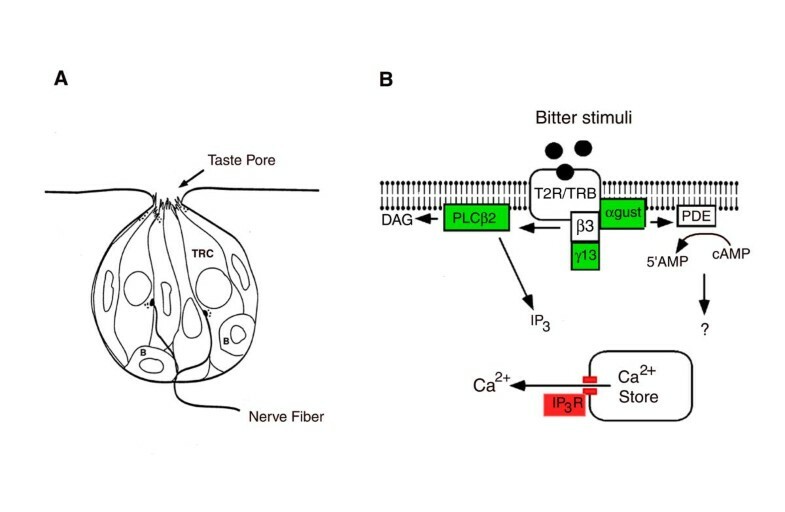 Taste transduction begins when sapid stimuli interact with the apical membrane of taste cells, usually resulting in taste cell depolarization, calcium influx, and transmitter release onto gustatory afferent neurons. Simple stimuli, such as salts and acids depolarize taste cells by direct interaction with apical ion channels. In contrast, complex stimuli, such as sugars, amino acids, and most bitter compounds bind to G protein coupled receptors, initiating intracellular signaling cascades that culminate in Ca2+ influx or release of Ca2+ from intracellular stores [1–3]. Diagrammatic representation of a rodent taste bud and important components of the bitter transduction pathway. (A) A typical taste bud consists of 50-100 taste receptor cells (TRCs) that extend from the basal lamina to the taste pore. Taste stimuli interact with taste receptors on the apical membrane, while nerve fibers form chemical synapses with the basolateral membrane. Basal cells (labeled B) along the margin of the taste bud are proliferative cells that give rise to taste receptor cells. (B) Bitter stimuli interact with T2R/TRB receptors located on the apical membrane. These receptors couple to a heterotrimeric G protein consisting of α-gustducin, β3, and γ13. Alpha gustducin activates phosphodiesterase (PDE), causing decreases in intracellular cAMP, while β3γ13 activates phospholipase C β2 (PLCβ2) to produce the second messengers inositol 1,4,5 trisphosphate (IP3) and diacylglycerol (DAG). The IP3 binds to receptors located on smooth endoplasmic reticulum, causing a release of Ca2+ into the cytosol. The purpose of this study was to identify the IP3 receptor isotype that is expressed in taste cells. Inositol 1,4,5-trisphosphate (IP3) is an important second messenger in both bitter and sweet taste transduction. In both pathways, activation of taste receptors stimulates a G protein-coupled cascade resulting in activation of phospholipase C (PLC), which cleaves phosphoinositol bisphosphate (PIP2) to produce the second messengers IP3 and diacylglycerol (DAG). The soluble messenger IP3 binds to receptors located on calcium store membranes, causing release of calcium into the cytosol, while DAG remains in the membrane, where it can activate downstream effectors. While little is known about the role of IP3 in sweet taste transduction, considerable data indicate that IP3 plays an important role in bitter transduction. The first evidence for the involvement of IP3 in bitter transduction was obtained by Akabas et al. , who used Ca2+ imaging to show that the bitter stimulus denatonium causes release of Ca2+ from intracellular stores. More recently, biochemical measurements have shown that several bitter compounds elevate IP3 in taste tissue [5–8]. Other studies, however, suggested that a decrease in cAMP, rather than an increase in IP3, mediated bitter transduction. In 1992, a chemosensory specific G protein, α-gustducin, was identified in a subset of taste cells . Alpha-gustducin, which is closely related to the rod and cone transducins, activates PDE to reduce intracellular levels of cAMP . Evidence for gustducin's role in bitter taste came from knockout studies, in which a targeted deletion of α-gustducin resulted in mice with a reduced sensitivity for bitter compounds . More recently, a variety of bitter compounds have been shown to activate gustducin in biochemical assays [11, 12], causing a decrease in intracellular cAMP levels via activation of PDE . It is now known that individual bitter receptors modulate both the IP3 and cAMP pathways (Fig. 1B). Bitter compounds bind to a family of G protein-coupled receptors called the T2R [14, 15] or TRB  receptors, which activate a heterotrimeric G protein consisting of α-gustducin and a βγ complex containing β3  and γ13 . Alpha-gustducin activates PDE to decrease intracellular levels of cAMP , while its βγ partners stimulate PLCβ2 to produce IP3 and DAG . Although it is clear that IP3 binds to receptors located on intracellular Ca2+ stores, the specific identity of IP3 receptors in taste cells is not known. There are at least 3 known isotypes of IP3 receptors encoded by different genes . Each protein product is about 300 Kda. Four subunits assemble to form a functional channel. Both homomultimeres and heteromultimeres have been reported . The N terminus of each subunit houses the IP3 binding domain while the C terminus anchors the protein to the membrane, is involved in the formation of the tetrameric protein, and forms the Ca2+ pore region. The general structure of each isoform is similar, however they differ in primary sequence, distribution, regulation, and IP3 affinity . In this study we used immunocytochemical methods to determine which IP3R isoform is expressed in taste cells and to examine the expression patterns of IP3 receptors relative to other proteins known to be important for taste transduction. We report that the Type III IP3 receptor is the dominant isotype expressed in rodent taste cells and that it is primarily found in the same subset of taste cells as other known signaling components of bitter transduction. A preliminary account of this work was published in abstract form . 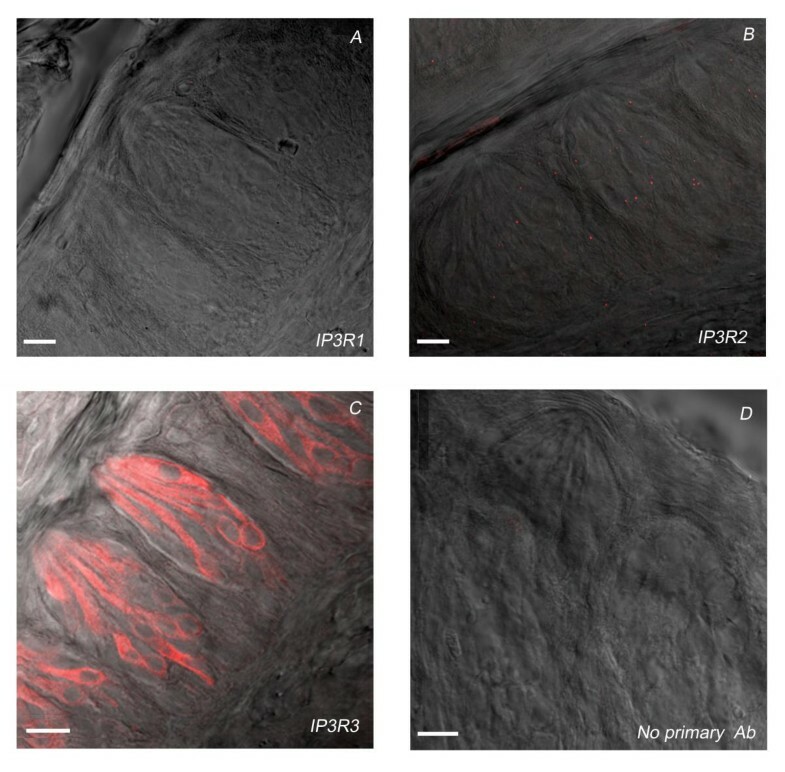 Forty micron thick rat sections containing circumvallate papillae were exposed to either anti-IP3R1, anti-IP3R2, or anti-IP3R3 antibodies and appropriate secondary antibodies. 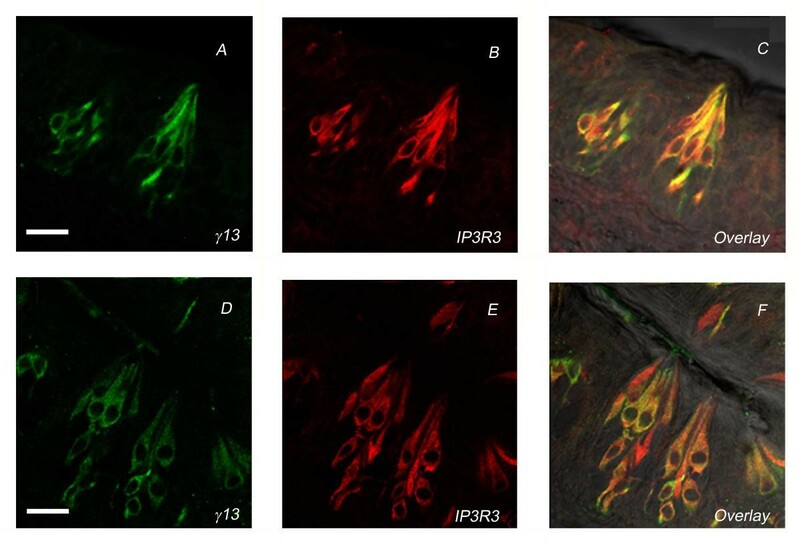 Laser scanning confocal microscopy of the resultant sections was used to examine the distribution of IP3 receptor immunoreactivity in rat circumvallate taste buds. Labeling for IP3R1 and IP3R2 was negligible (Figs. 2A, B). In contrast, immunoreactivity to IP3R3 was robust and present in a large subset of taste cells (Fig. 2C). Generally, immunoreactivity extended throughout the cytoplasm of labeled cells. Immunoreactivity was found only in taste buds and was not present in the lingual epithelium surrounding taste buds. Primarily intragemmal taste cells were labeled, proliferative basal cells of the taste buds did not appear to be labeled. In addition, gustatory nerve fibers did not appear to be labeled. Controls in which the primary antibody was omitted showed no specific labeling (Fig. 2D). Laser scanning confocal micrographs (LCSMs) of rat circumvallate taste buds labeled with antibodies against the three isoforms of the IP3 receptor. (A). IP3R1 immunoreactivity (IR), (B) IP3R2 IR, (C) IP3R3 IR, (D) no primary antibody control for IP3R3. The scale bar in each figure represents 10 μm. To determine if IP3R3 could be involved in bitter taste transduction, we performed double-label immunocytochemistry with antibodies to IP3R3 and components of the bitter signaling pathway. For most experiments, mouse as well as rat tissues were examined. Exposure of tissue to antibodies against α-gustducin and IP3R3 showed that all α-gustducin immunoreactive (IR) cells were also immunoreactive for IP3R3, however, a subset of IP3R3-IR taste cells lacked α-gustducin-IR (Fig. 3). Further analysis with antibodies to other signaling components of the bitter transduction pathway are shown in Figs. 4-5. 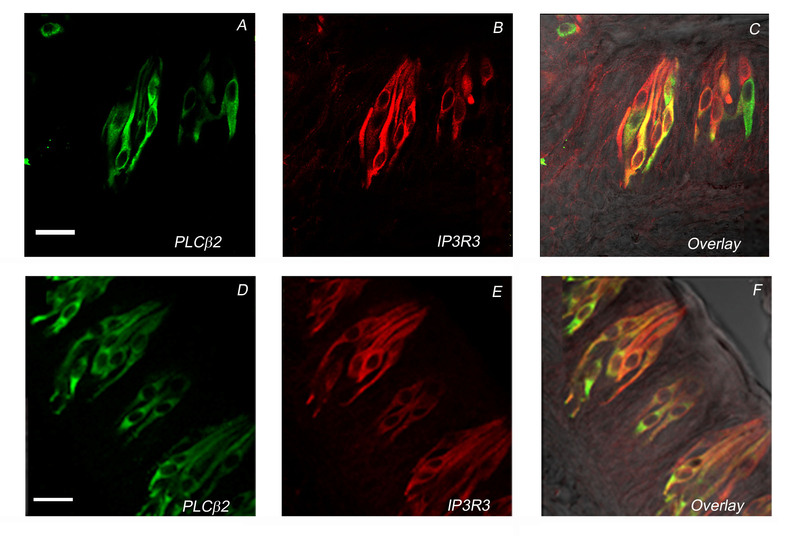 Immunoreactivity for PLCβ2 and IP3R3 showed nearly complete coincidence of labeling (Fig. 4). Immunoreactivity for PLCβ2 extended throughout the cytoplasm, as did immunoreactivity for IP3R3. However, some taste cells appeared to differ in the degree of labeling for each antibody, with some cells showing more intense label for IP3R3 and others for PLCβ2. We also compared IP3R3 IR with γ13 IR in rat and mouse circumvallate taste buds. As shown in Fig. 5, nearly complete co-localization was again observed for both antigens. Results from PLCβ2 and γ13 double label experiments were similar for mouse and rat taste buds. Taken together, these immunocytochemical data indicate that IP3R3 is the predominant isoform of IP3 receptor expressed in taste cells, and that it is found in the same subset of taste cells as other components known to be involved with bitter taste transduction. LCSMs of rat circumvallate taste buds double labeled with antibodies against α-gustducin (green) and IP3R3 (red). Panel C shows an overlay of A and B with the differential interference contrast image to enhance visualization of individual taste cells. Scale bar is 10 μm. Note that all α-gustducin IR taste cells are also IP3R3 IR, however not all IP3R3 IR cells are α-gustducin IR. LCSMs of rodent circumvallate taste buds double labeled with antibodies against PLCβ2 (green) and IP3R3 (red). Panels A-C are from mouse; D-F are from rat. Panels C and F represent the overlay, as described for Figure 3. Scale bar is 20 μm. Note almost complete co-localization of IP3R3 IR and PLCβ2 IR. LCSMs of rodent circumvallate taste buds double labeled with antibodies against γ13 (green) and IP3R3 (red). Panels A-C are from mouse; D-F are from rat. Panels C and F represent the overlay as described for Figs. 3-4. Scale bar is 20 μm. Note nearly complete co-localization of IP3R3 IR and γ13 IR. IP3R3 is heavily expressed in a large subset of vallate taste cells of both mouse and rat, suggesting that IP3R3 plays a similar role in both species. IP3R3 appears to be located throughout the cytoplasm of taste cells, consistent with its expected location on the smooth endoplasmic membrane . In other cells, IP3 receptors have also been found on the plasma membrane , but because of heavy cytoplasmic labeling, we were unable to resolve whether it was also located on the plasma membrane. One caveat is that antigen retrieval was necessary to observe IP3R3 labeling. However, using this method with α-gustducin, PLCβ2, and γ13 antibodies did not alter their immunoreactivities; similar results were obtained with and without antigen retrieval. Thus, we do not believe that antigen retrieval compromised our interpretation of the results. Taste cells expressing IP3R3 have an elongate, bipolar morphology, suggestive of Type II taste cells . Indeed, a subset of the IP3R3 immunoreactive taste cells is also immunoreactive for α-gustducin, which has been identified exclusively in Type II cells . However, whether IP3R3 is expressed exclusively in Type II cells awaits further investigation. It is noteworthy that a subset of taste cells does not express IP3 receptors. This raises the question as to whether these cells have intracellular Ca2+ release mechanisms. Ryanodine receptors also mediate release of Ca2+ from intracellular stores, however a previous study showed no effect of ryanodine on bitter taste responses in Necturus taste cells . IP3R3 immunoreactivity was expressed in the same subset of taste cells as PLCβ2 and γ13, and by inference from other data, β3 . Antibodies against these proteins have been shown to inhibit IP3 formation to bitter compounds in taste cells [8, 17, 18], suggesting that they are important components of the bitter-stimulated IP3 pathway. It is of interest that only a subset of IP3R3 IR cells express α-gustducin, a G protein known to be involved with bitter transduction. These data suggest that alpha subunit(s) in addition to α-gustducin must be involved with the IP3 signaling pathway in α-gustducin negative cells. Several G protein alpha subunits have been identified in taste cells, and are potential candidates for this role. These include α-transducin , Gαi-2, Gαi-3, Gαs , and Gα15 and Gαq . Further experiments will be required to identify the additional alpha subunits that couple to this pathway, and the receptors that activate these G proteins. In addition to its role in bitter transduction, IP3 is involved in the transduction of artificial sweeteners . Interestingly, mice lacking α-gustducin are compromised in the detection of sweet compounds as well as bitter compounds, suggesting that sweet receptors may also couple to α-gustducin . Approximately two-thirds of the α-gustducin positive vallate taste cells express T2R/TRB receptors . It is possible that the remaining α-gustducin positive vallate taste cells express receptors for synthetic sweeteners, and that they couple to the IP3 signaling pathway. Thus, IP3R3 may be involved with sweet as well as bitter taste transduction. IP3R3 is widely expressed in cells in a variety of tissues including adult pancreatic islets, kidney, gastrointestinal tract, salivary glands, and brain [29, 30]. Many of these cell types, including taste cells, are polarized, where Ca2+ signals are initiated on the apical membrane and must propagate long intracellular distances. IP3R3 is particularly well suited for this function, since it is the only IP3 receptor isotype that is not inhibited at high Ca2+ concentrations . In fact, under certain conditions, Ca2+ can stimulate IP3R3, making it a likely candidate for participation in the propagation of Ca2+ oscillations. In taste cells Ca2+ oscillations have been observed in response to bitter stimuli (T. Ogura and S.C. Kinnamon, unpub. observations), and it's likely that IP3R3 participates in these Ca2+ oscillations. Another interesting feature of IP3R3 is that cAMP-dependent phosphorylation can inhibit its activity in pancreatic acinar cells [32, 33]. In these cells, cAMP-dependent phosphorylation decreases Ca2+ release from intracellular stores and slows the frequency of Ca2+ oscillations. These data suggest a possible role for α-gustducin in bitter taste transduction. Specifically, activation of α-gustducin, which decreases intracellular cAMP by activation of PDE , may lead to a decrease in the cAMP-dependent phosphorylation of IP3R3. This would disrupt the negative control of the receptor and potentiate the Ca2+ response. Interestingly, Gαi-2, another alpha subunit heavily expressed in taste cells , also functions to decrease intracellular levels of cAMP and may lead to regulation of IP3R3. Further experiments will be necessary to clarify the role of these alpha subunits in regulation of the IP3 pathway in taste cells. The principal finding in this study is the identification of IP3R3 as the dominant isoform of the IP3 receptor in taste cells. IP3 has been shown to be an important second messenger in both bitter and sweet taste transduction, and IP3R3 likely mediates the Ca2+ release from intracellular stores in response to IP3. In bitter taste transduction, many signaling components have been identified, and IP3R3 is co-expressed in the same taste cells (Fig. 6). Bitter stimuli bind to T2R/TRB taste receptors coupled to a heterotrimeric G protein complex consisting of α-gustducin and its partners, β3 and γ13. Alpha gustducin activates PDE, causing decreases in intracellular cAMP, while its βγ partners stimulate PLCβ2 to produce IP3 and DAG. IP3 subsequently binds to IP3R3, causing increases in cytosolic Ca2+, due to release from intracellular stores (Fig. 1B). The unique properties of IP3R3, including its regulation by Ca2+ and cAMP dependent kinases, are consistent with known characteristics of bitter signaling in taste cells. 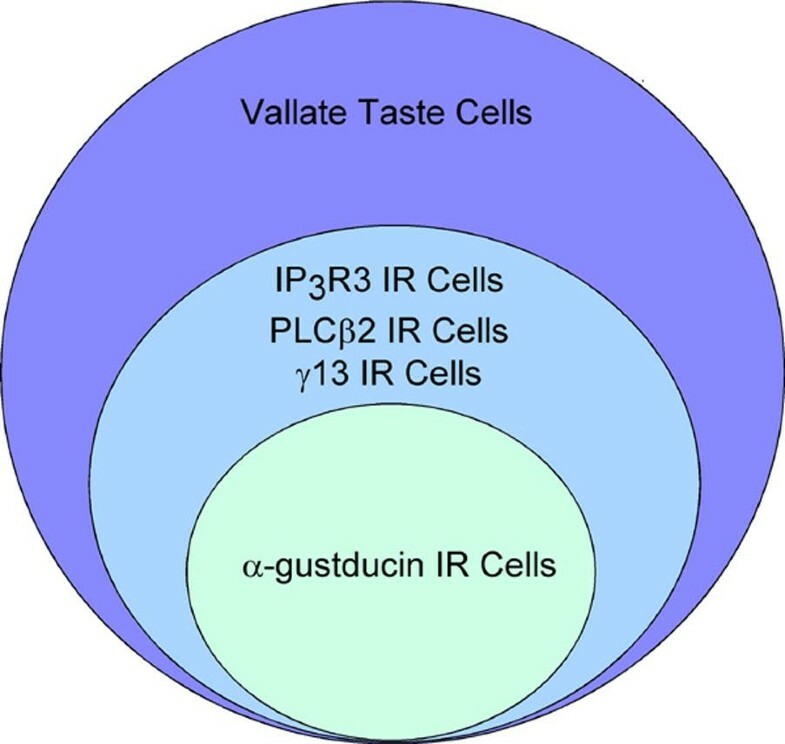 Qualitative representation of the co-expression patterns of IP3R3, α-gustducin, PLCβ2, and γ13 in circumvallate taste buds. Adult male Sprague Dawley Rats and adult C57/B1 male or female mice were obtained from Charles River Laboratories (Wilmington, MA). Animals were cared for in compliance with the Colorado State University Animal Care and Use Committee. Rats or mice were deeply anesthetized by intraperitoneal injections of Sodium Pentobarbitol, 40 mg/Kg (Veterinary Laboratories, Inc., Lenexa, KS). Following anesthetization animals were injected intracardially with heparin (Elkins-Sinn, Inc., Cherry Hill, NJ) and 1% sodium nitrate. Rats were perfused with 80 ml of 4% paraformaldehyde and mice with 30 ml. Following perfusion tongues were removed and immediately placed into fresh 4% paraformaldehyde (Electron Microscopy Sciences, Ft. Washington, PA) in 0.1 M phosphate buffer for approximately twenty minutes. Tongues were then put into a 20% sucrose solution in 0.1 M phosphate buffer overnight for cryoprotection. Forty micron sections were cut on a Leitz 1729 digital Kryostat and collected in 0.1 M phosphate buffered saline (PBS, pH7.2). Following sectioning, the slices were washed in PBS three times for ten minutes each at room temperature. Antigen retrieval was performed by placing sections into a 10 mM sodium citrate solution at 80°C for 30 minutes. This was done to help disrupt protein cross-bridges formed by formalin fixation and expose antigen binding sites. In some experiments the incubation time in sodium citrate was reduced to 5 minutes, and labeling was still apparent. All sections were incubated in blocking solution for 1-2 hours at room temperature. Blocking solution contained 0.3% Triton X-100, 1% normal goat serum, and 1% bovine serum albumin in 0.1 M PBS. All chemicals were purchased from Sigma Chemical Corporation (St. Louis, MO) unless otherwise noted. Polyclonal antibodies raised in rabbit against the sequence N1829KKKDDEVDRDAPSRKKAKE1848 near the COOH-terminal domain of human IP3R1 were purchased from Affinity Bioreagents, Inc. (Golden, CO, cat #PA1-901). Polyclonal antibodies raised in rabbit against a synthetic peptide with a sequence derived from the cytoplasmic, NH2-terminal domain of the rat IP3R2 protein (E317LNPDYRDAQNEGKTVRD334), were also purchased from Affinity Bioreagents, Inc. (Golden, CO, cat #PA1-904). Monoclonal mouse anti-IP3 R3 was purchased from Transduction laboratories (Lexington, KY, cat #131220). Monoclonal mouse anti-IP3R3 recognizes the peptide sequence 22-230. Rabbit anti-α-gustducin (cat #SC-395) directed against a peptide fragment containing amino acids 93-113 of α-gustducin; and rabbit anti-PLCβ2 (cat #SC206) were obtained from Santa Cruz laboratories (Santa Cruz, CA). Rabbit anti-γ13 was prepared as described previously . All secondary antibodies were purchased from Jackson ImmunoResearch Laboratories, Inc. (West Grove, PA). These included: Rhodamine Red X anti-rabbit (# 111-295-045), Rhodamine Red X anti-mouse (# 115-295-146), Cy-5 anti-mouse (# 115-175-146), Flourescein (FITC) anti-rabbit (# 711-095-152). Cy-5 anti mouse antibodies were tested on mouse tissue prior to these experiments to insure no background labeling. Sections from rat circumvallate papillae were incubated with primary antibodies overnight at 4°C. Controls in which the primary antibodies were excluded were included in each experiment. The primary antibodies rabbit anti-IP3R1 and rabbit anti-IP3R2 were diluted to 1:100 in blocking solution. Mouse anti-IP3R3 was used at 1:50 in blocking solution. Following overnight incubation in primary antibodies, sections were washed three times for ten minutes each in PBS at room temperature. Rabbit anti-IP3R1, rabbit anti-IP3R2, and no primary antibody control sections were then incubated with the secondary antibody Rhodamine Red X anti-rabbit (1:100 in blocking solution) at room temperature for two hours. Mouse anti-IP 3R3 labeled sections, were incubated in Rhodamine anti-mouse. Following incubation with secondary antibodies, sections were washed three times for ten minutes in PBS and mounted on RITE-ON micro slides (Becton, Dickinson and Company, Portsmouth, NH) using Flouromount-G (Southern Biotechnology Associates, Inc., Birmingham, AL, cat# 0100-01) and coverslipped (VWR Scientific, Media, PA). Slides were stored at 4°C. Double-labeled experiments involved incubations with two primary antibodies and subsequent incubation with appropriate secondary antibodies. Rabbit anti-α-gustducin was used at 1:500 in blocking solution. Both rabbit anti-PLCβ2 and rabbit anti-γ13 were used at 1:1000 in blocking solution. Following incubation with primary antibodies, sections were washed in PBS three times for ten minutes each. Both rabbit anti-IP3R1 and rabbit anti-IP3R2 labeled sections were then treated with Rhodamine Red X anti rabbit antibodies (1:100). For IP 3R3 double-labeled sections, Cy-5 anti-mouse secondary antibodies were applied. Rabbit anti-α-gustducin was visualized using FITC anti-rabbit (1:100) secondary antibodies. Both rabbit anti-PLCβ2 and rabbit anti-γ13 were labeled with FITC anti rabbit (1:100). Incubations with secondary antibodies were done at room temperature for two hours. Sections were then washed in PBS three times for ten minutes each, mounted using flouromount-6, and coverslipped. Lingual sections were viewed with an Olympus Fluoview laser scanning confocal microscope. Sequential scanning techniques were used for some double-label experiments and showed no differences from simultaneous scans. There is no overlap between the excitation and emission spectra for the FITC and Cy5 secondary antibodies used in the double label experiments. Images were captured with an Olympus FVX-IHRT Fluoview Confocal Laser Scanning Microscope. Lasers included Argon 488 nm, HeNe 543 nm, and HeNe 622. Fluoview software was used for data acquisition. Images were processed and printed using Photoshop 6.0 software. We thank Dr. Vince Dionne for the initial motivation for this study, and Ms. Barbel Böttger for the suggestion of using antigen retrieval. We also thank Dr. Kathryn Medler for technical advice and Dr. Tom Finger for comments on the manuscript. RFM is an Associate Investigator of the Howard Hughes Medical institute. This study was supported by NIH grants DC00244 and DC00766 to SCK and DC03155 to RFM. Note added in proof: Similar results were obtained by Miyoshi et al. and appear in the current issue of Chemical Senses (Chem Senses 26:259-265, 2001).